Is my goat kid fat? 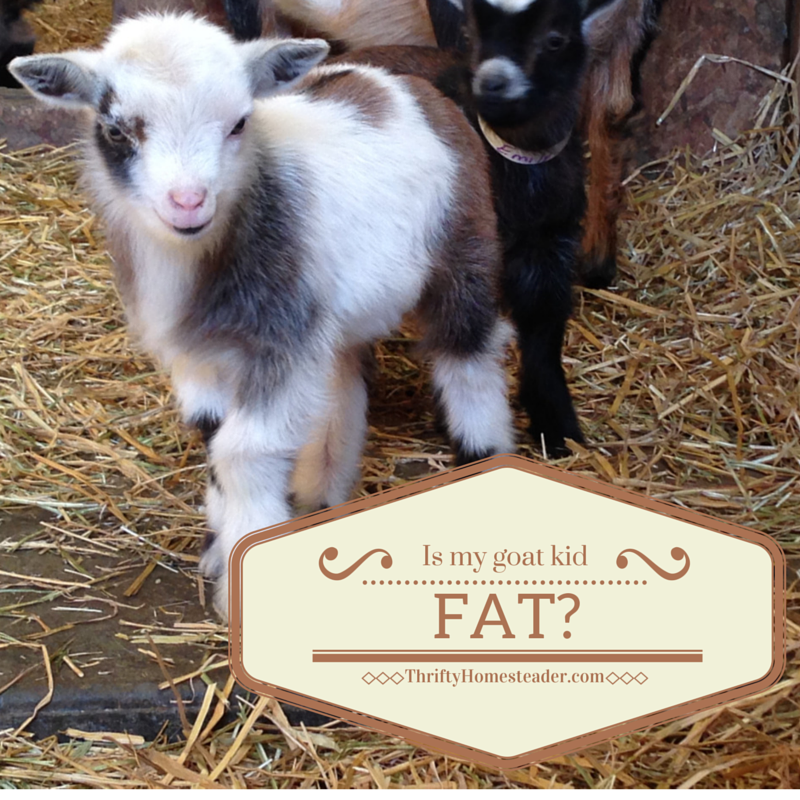 A lot of people new to goats think a kid is “fat” when it has a big belly. However, a big belly — sometimes called “hay belly” — is a sign of malnutrition, either from a parasite overload or not getting enough milk. And not enough milk leads to parasite problems because the kids are not getting enough of mom’s antibodies to fight them. Malnourished kids get a big belly because they are eating as much solid food as they can stuff into themselves, but it doesn’t have the nutrients they need for growth. If they have a parasite overload, they are overeating because, depending upon which type of parasite it is, the parasites are either sucking their blood or consuming the food in their digestive system, either of which leaves the kid malnourished and possibly anemic. So, how do you know if your kid is fat or getting too much milk? Goats put fat on their spine, ribs, and brisket, not on their bellies. There are lots of goats with big bellies that are actually underweight. Here is a great PDF on body condition scoring in goats. I have seen many kids that people thought were “fat” when they actually had a body condition score of 2, which is underweight. When kids get too much milk, they get diarrhea. This usually only happens when bottle-feeding because some people try to get the kids down to only two bottles a day, which means large amounts of milk in each bottle. When kids get more milk than they need but not too much, they will grow very fast. When our best milker had triplets at her prime, one of her bucklings was 30 pounds at two months, which is huge for a Nigerian. My daughter referred to him as “the draft horse.” We have lots of kids that are sold at 3 months, and people exclaim that they’re the same size as their 5-6 month old kids at home. It’s because we don’t limit the amount of milk they get from mom for the first two months. That also means that we rarely have any of the problems that people think are normal, such as coccidiosis and parasites in kids. We have many goats here now that have never had a coccidiostat or a dewormer in their entire lives — because they didn’t need it. If they need it, I will certainly give it to them. It all starts with a solid foundation of good nutrition provided by mom’s milk, coupled with good management, which I discussed last month in this post. 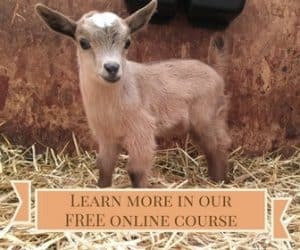 Many people who are new to goats think that they can start separating the doe from the kids within a couple of weeks of birth. If a doe has only a single kid, then you can actually start milking her the day she kids, but if she has two or more, it’s probably not a good idea to start separating the kids regularly until the kids are two months old. It is definitely a bad idea to separate kids from their dam if the doe is a first freshener because she is unproven as a milker, so you have no idea what her production will be like. With first fresheners it is a great idea to put them on the milk stand twice a day and try to milk them — but NOT separating her from the kids beforehand. I say “try” because you may or may not get any milk, depending upon when the kids last nursed. That’s fine if you don’t get any milk because she’s producing just enough for the kids. If she has produced a little extra, you can take it. But separating her from the kids regularly is setting her up for producing less milk than if you left them together. Research has shown that nursing kids cause the doe to release oxytocin, which results in better production than when a doe is milked by a person or machine. The idea that you can separate babies from their mother overnight from birth comes from the dairy cow world. For the past century, milk production in cows has been driven so high that most dairy cows produce far more than a single calf could possibly consume, so separating them overnight is usually not a problem. However, goats have not been bred to produce such astronomically high volumes of milk, so most of them only produce enough to feed their kids for the first couple of months when the kids need the most milk because they are growing the fastest. I often see sale ads where people say that a goat is “small because she was one of quads” or an even larger litter. Being a multiple is not an excuse for being small by two to three months of age. There are three reasons for a kid that age to be small: parasites, not enough milk, or genetics. Even though a kid may be born small, if it receives adequate nutrition, it should catch up in size to other kids its age within a couple of weeks. Far too many people think that a doe will make enough milk to feed whatever number of kids she has, even if it’s five or six. This is simply wrong, and it can result in small or dead kids within a few days or a few months. If a kid is getting as much milk as its siblings, it would be growing as much as its siblings. When we had our first set of quads 11 years ago, one almost died at two weeks of age because everyone in the Yahoo goat group was saying that a doe could feed quads with no problem. A year later, another doe had quads, and one died at only two days of age because it wasn’t able to get enough milk. Today I don’t normally let a doe try to raise four unless she has a track record of exceptional production. Click here for more info on How many kids can a doe feed? Some people think that once a kid is eating solid food, it doesn’t need milk any longer. Nothing could be further from the truth. Dam-raised kids are usually eating solid food within a few days of birth. However, nothing else can provide the high levels of nutrients, as well as the antibodies, of fresh milk. Baby goats are born with very immature immune systems, and without all the antibodies of their mother’s milk, they usually have problems with coccidiosis, which is why many people who bottle-feed kids will start them on a coccidiostat or medicated milk replacer at three weeks of age. 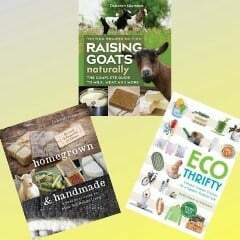 Be a hands-on goat breeder! It’s not enough to look at kids from across the barn and assume that they’re healthy. You need to pick them up every day or two so that you know how their weight compares to the other kids. You also need to run your fingers down their spine and under their chest. Is there plenty of meat along the spine? Or does the spine feel sharp? The body condition guide linked above is not just for adults. Kids should have the same scoring done on them even more often than adults. It’s not that hard to turn around an adult that has a problem with parasites, but if a kid is not growing adequately, it can be impossible to turn around if you don’t catch it soon enough. That means you could have an animal that never reaches its genetic potential. In the case of does, they won’t be big enough to breed until closer to two years, and in severe cases, their growth can be permanently affected, and they’ll never be big enough to breed. Or in the worst cases, you’ll wind up fighting parasite overloads for a few months, and the kids will ultimately die. What should we use to treat parasites in goats?